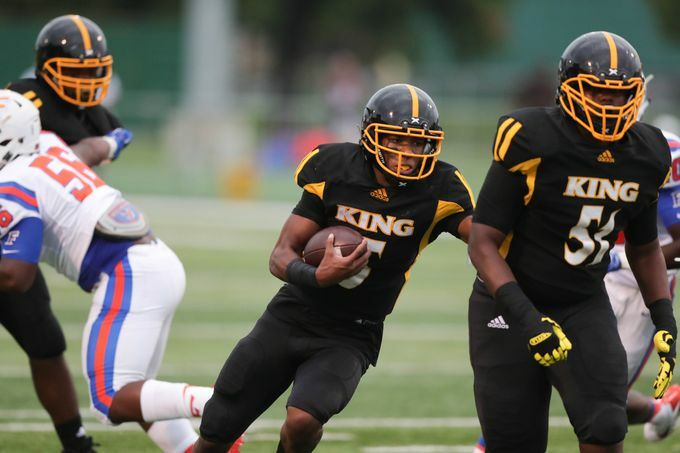 Detroit King senior quarterback Dequan Finn (No.5) is committed to Central Michigan. The 8-hour drive back to Illinois will not be too enjoyable for the East St. Louis Flyers (ESLF), who were grounded by the Detroit Martin Luther King Crusaders, 52-38, Saturday night at Wayne State University in the annual Prep Kickoff Classic. King senior quarterback Dequan Finn, who is committed to Central Michigan, led the assault on ESLF, recording six total touchdowns in the game through the air and on the ground; three running and three passing. Finn was 9-21 for 156 yards passing and three ran 16 times for 283 yards. Detroit King’s Dequan Finn was the player of the game against East St. Louis with 439 total yards and six touchdowns. The Crusaders (1-0) took a 26-18 lead into halftime, with two touchdown passes to wide receiver Dominick Polidore-Hannah late in the second quarter. King scored on its first possession of the third quarter, on an 80-yard run by Finn. With 6:29 left in the quarter, Finn was all alone in the open field again, this time running 63 yards for the touchdown to make it 39-18. They would push their lead to 46-18 at the end of the third. ESLF (0-1) ran into some turbulence in the third quarter with King, giving up 20 points, but was able to score 20 points of their own in the final quarter to make the game closer on the scoreboard. The Crusaders gave up 38 points to one of the better high school football programs in the country and head coach Tyrone Spencer knows his defense will have to be much better next week. King will load the bus on Friday, August 31 to play in a hostile environment at Hackley Stadium in Muskegon against the defending Division 3 state champs. The Crusaders are 0-4 all-time against the Big Reds, with the last matchup coming in 2009, which Muskegon won 40-21.